If you see from my Snapchat account (ID: myfunfoodiary), I rarely go out nowadays because I was busy in renovating the house lately. Fiuuh! And while my family members go out for exercise twice to three times a week, and some of my friends are on a diet, how about us? We eat this cake for breakfast or most of the time in one day because the cake is really good! So here, I want to share my enjoyment about this cake. We have enjoyed the cake samples from Spiku Kenari (Walnut Spekkoek) by Santi’s Cake that we received a week ago. Even my mom, she liked it a lot! Santi’s Cake is a family-owned business, who runs a cake shop specializing in creating this unique cake since 1999 and it seems, has been popular in a city where they originated, Surabaya, and among spiku lovers. The Walnut Spekkoek came in a big square size 24x24cm with a bunch of kenari (walnut) on top of the cake. And I realized the middle part of the cake is somewhat lower because of the stack of walnut, but it was not a problem for us. Most people outside Surabaya would say this cake as Kue Lapis Surabaya but in Surabaya, the cake itself is known as Spiku. At first, Santi Cake made a classic Lapis Surabaya that consists of three layers of sponge cake in which a layer of chocolate sponge cake sandwiched between two layers of original or yellow sponge cake. But then lots of requests coming from their customers, just to make the yellow layer, and the more people liked it after that. Even though this Spiku Kenari only has one layer, oh it was so good! The texture was so soft and moist. It tasted delicious, especially with a bunch of chopped walnut (kenari) added on top of the spekkoek, that creates a unique flavor together in every bite. Crunchy, addictive and not greasy at all! Since it’s a big cake, it’s perfect for sharing and light enough to eat at tea time or for any occasion. I was pleased to know that they only use 100% natural ingredients and no preservatives to keep the old spekkoek tradition alive. It’s timeless and delicious!! 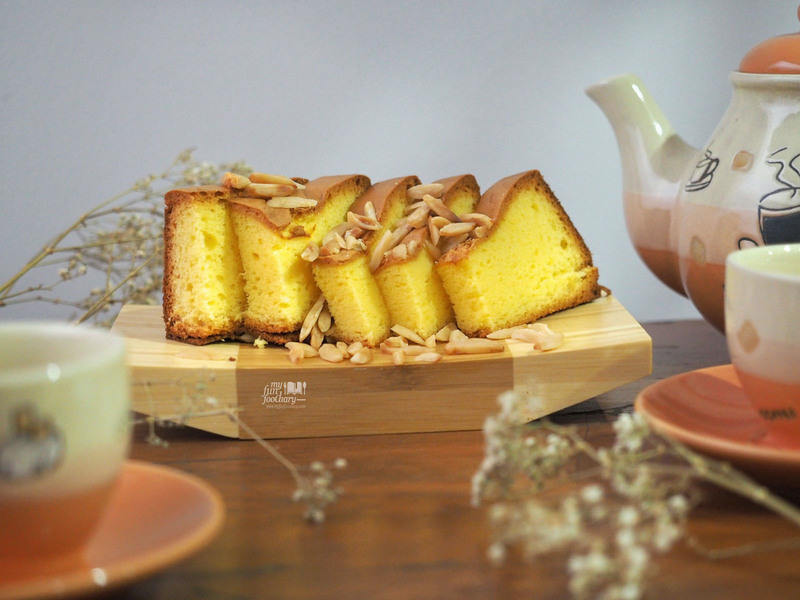 For now, Spiku Kenari by Santi’s Cake already has two branches in Surabaya and one branch in Bali. But, for those of you who wants to order this Spiku Kenari, they also provide delivery service outside the city and outside the island with a special packing via courier or delivery service such as TIKI / JNE. I got mine nicely wrapped and arrived safely on my doorstep. So, don’t worry about that but make sure to place your order in advance. Telp. 031-599 2521, 591 4406.